So all this time it was really a recruiting tool? What if you got a really high score in a video game, and the game came to life? Well that's sort of what happens in 1984's The Last Starfighter, which serves as both an exploration and a deconstruction of wish fulfillment. Alex Rogan has spent his whole life stuck in his family's trailer park, but his wish to leave it turns into more than he bargained for when the space-shooter arcade game he manages to beat turns out to have been a test to find the best space pilots in the universe. When Alex discovers that the actual Star League chose him to fight against the very real Xur and the Ko-Dan Armada, he refuses to go along with it. When Alex demands to return home, he finds an android duplicate of himself, Beta, having a tough time playing the role of Alex in the trailer park. After he reluctantly returns to space, the fun really begins. The Last Starfighter created all of its spaceship effects shots using only computer-generated images (one of the first films to do so), but since it did so during the very early days of CGI, said effects stand out as such. A Cray X-MP rendered all of the film's CGI; as a bit of perspective, the 800 MHz Pentium III processor available to consumers fifteen years later — or the average smartphone of 2012 — matches the processor power of what was then the most powerful supercomputer in the world. Not to be confused with The Starfighters. 2-D Space: The at-the-time brand new CGI effects allowed for a rare aversion of this trope; the battles are fought in a very noticeable 3D environment. The Gunstar chair that Alex sits in allows for full 360 degree movement, including flipping him upside down at one point, which makes even more sense, as the Gunstar is sort of an outer-space gunship, made to attack opponents in any direction regardless of the one the ship is aimed at (as opposed to the Ko-Dan, who are in traditional "fighters"), and Alex is the gunner, not the pilot. Ace Pilot: Alex mostly fulfills this trope, but slightly subverts it as he is a talented gunner, not a pilot - Grig, the navigator, takes care of that, and the Gunstar, though fast and heavily armored, doesn't seem to be particularly maneuverable. Actor Allusion: The character of Centauri is clearly based on Robert Preston's most famous character, Harold Hill from The Music Man. Actual Pacifist: The novelization features the League as such. They had some real trouble recruiting soldiers - and finding a politician to read them a speech. Aliens Speaking English: Centauri does, due to already being familiar with Earth from producing and distributing the Starfighter video games, but the Rylans and other aliens don't. Alex has to wait a bit until they give him a translator. Afterwards, aliens are heard speaking English even when Alex isn't around, but this is likely Translation Convention. The novelization makes it clear that both speakers need translators and handwaves Grig talking to the humans at the end by saying that Alex taught him some English before they landed. All Just a Dream: Beta assures Louis of this when he sees Beta take off his own head and start working on it. Beta: Louis. You are having a terrible nightmare. Go back to sleep. (when Louis keeps peeking) LOUIS! 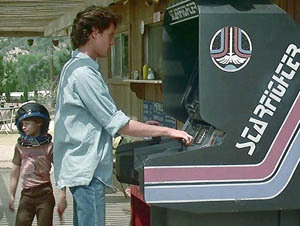 And You Thought It Was a Game: Alex (and everyone else in his town) thinks the Starfighter video game is just that. He's quite surprised to learn that it's a recruitment tool. Arc Words: "Greetings, Starfighter! You have been recruited by the Star League to defend the frontier against Xur and the Ko-Dan armada!" Archnemesis Dad: An Inverted Trope here — the Big Bad's father is the Big Good. As You Know: Ambassador Enduran uses this trope almost by name — "as you all know" — as he mentions to the Starfighters what the Frontier is, why it's important, and how, because of a dark betrayal (he means Xur), the Frontier will soon collapse. Naturally, the audience and Alex are hearing this for the first time. Justified in that the Ambassador is orating a standard "Welcome to the Star League, New Starfighters" speech given to new recruits. Ascended Fanboy: Alex goes from being the best at a video game to being the best (and only) Starfighter. An Invoked Trope, since unknown to him the game was deliberately set up with the same controls. Alex: Wait a minute, when did the hanger go out? Grig: I told you, when Xur attacked. Alex: And where were the starfighters? Alex: You mean they're dead!? Grig: Death is a primitive concept. I prefer to think of them as battling evil... in another dimension! Battle Chant: When Ambassador Enduran gives a pep talk to the personnel of the Starfighter base, he concludes by saying "Victory or death!". They all start chanting "Victory or death!" in unison. Beam Spam: The Death Blossom attack fires both beams and missiles in all directions to take out the enemy fleet. Big Bad Wannabe: Xur only thinks he's in charge of the Ko-Dan armada. They barely tolerate his presence until they have crossed the Frontier. Bizarre Alien Biology: It's telling that Grig, a lizard-like humanoid, is perhaps the most normal-looking of all the aliens in the film (other than the Rylans, who look mostly human, other than having big foreheads and white hair in unusual styles). And then, of course, there's the Bogati whose tentacle-thing Alex accidentally steps on. Alex: I'm sorry. It was an accident, I didn't mean to step on your... whatever that is. Blood Knight / Proud Warrior Race: Bogati, though they're never seen in action. Breaching the Wall: The Ko-Dan Armada has been kept beyond the frontier of the civilized galaxy by an energy wall generated by thousands of satellites in a grid formation. That is, until the Ko-Dan laser-bore a hole in this wall, through which they launch meteors at Star Base. The damage created by these meteors disables the satellites, so the frontier wall dissipates, allowing the armada free go at the galaxy. The Caligula: It's implied that Xur's treachery and megalomaniacal tendencies are the result of something being very messed up in his head. The Call Knows Where You Live: After Alex initially refuses The Call, Xur sends an assassin after him. Centauri's near-sacrifice show him that his only chance of survival is with the Star League. Beta: At least up there, you have a fighting chance in a Gunstar. Card-Carrying Villain: Xur. And everyone knows it. The only reason the bad guys even listen to him is because he holds vital information. Once they use it, they get him off the bridge so they don't have to listen to his raving anymore. They obviously have to restrain themselves to keep him around that long, especially since he seems to have deluded himself into believing he's in charge. Casting Gag: In either this or a very weird case of timing, Catherine Mary Stewart played a video game-obsessed girl in Night of the Comet, which was made and released around the same time. Catch-22 Dilemma: A tactical variant, lampshaded by Alex when Grig explains the plan of attack against the Ko-Dan Armada. Alex: Wait a second. We knock out the turret to get the fighters. But to get the turret, we've gotta get through the fighters. We're dead. Chew the Scenery: Not one moment of Xur's onscreen time is wasted without a chunk of scenery getting toothmarks. The Chosen Many: The Starfighters. Unfortunately all but Alex die in the initial attack when the base is mostly destroyed. Christmas Rushed: Gets an In-Universe mention. Centauri: Return the money! Are you delirious? Do you know how long it took to invent the games? To merchandise them? To get them in the stores by Christmas? Cluster F-Bomb: Implied Trope. We don't hear what Alex is saying when he's told he's the only Starfighter left, but given whatever he's saying is drowned out by the noise of the ship's launch, it's likely something that would have upped the film's rating. Colony Drop: The Ko-Dan command ship destroys Starfighter Command by firing a volley of small asteroids at it with a mass accelerator. Comic-Book Adaptation: By Marvel Comics. Cool Car/Cool Starship/Flying Car/Transforming Mecha: Centauri's, which took the angular wedge design of the DeLorean, turned it Up to Eleven, then made it a transforming starship. It's not made clear how old Centauri is (a reference to an "Excalibur gambit" implies he was around at the time of King Arthur), but he's definitely Seen It All and has copious advice for Alex. Otis gives Alex advice about making something of his life and helps give him the motivation to accept The Call when it makes its return trip. Cool Old Lady: Maggie's grandma. When Maggie is conflicted about whether to leave Earth to go with Alex, Granny encourages her, just so long as she writes back. Cool Spaceship: As the first sci-fi film to have all its space scenes rendered in CGI, all the ships are fairly cool. Alex's Gunstar is the top of the line: a Super Prototype with advanced weapons and shielding systems that can take out an armada all by itself. Cosy Catastrophe: Louis is not afraid at all when Alex's Gunstar lands; he thinks it's awesome. Louis: Woooo! All right, we're being invaded! Cranial Processing Unit: When the Beta unit (robot) impersonating Alex takes off its head, the head can continue to talk normally. Crazy Cultural Comparison: As Alex and Grig fly through the tunnels of an asteroid, Grig mentions that it reminds him of home. That leads to a chat comparing their species' differences in families, dwellings, and games... which inspires Alex to suggest hiding as the Ko-Dan Armada goes by, then make a surprise attack on them. Grig: Your plan might really have worked. What a pity there are no Starfighters left to carry it out. Cult: Xur's father mentions the "Xurian cult" that had to be put down in his I Have No Son! speech. Curse Cut Short: Alex, when Centauri's Star Car first takes off. Cutting the Knot: How to get through the fleet to get to the turret that makes the fleet so effective? Wait in something like an asteroid for the ships to pass, and you have an open shot at the turret. Otis gives one to Alex early on, minutes before he beats the Starfighter record and kicks off the plot. Otis: Things change. They always do. You'll get your chance. The important thing is when it comes- you've got to grab with both hands and hold on tight. Deadpan Snarker: Beta, surprisingly - the clone is snarkier than the original. Beta: (rolling his eyes) Oh. Save the whales but not the universe. Death In All Directions: The "Death Blossom" special weapon in Alex's prototype Gunstar. Defictionalized: A fan game that attempts to recreate the arcade game depicted in the film was released 23 years after the movie . The Atari release planned along with the movie never materialized, despite being mentioned in the credits. Description Cut: Happens right after Xur shows the execution of the master spy for all of the Starfighters to see. Centauri: Heh... so! You still wanna go... and miss all the excitement? Dies Wide Open: Centauri, after his heroic sacrifice to save Alex from an assassination attempt. When Alex shows Grig a family photo, it is of himself, Louis, Maggie, and both of his parents, but his dad never appears elsewhere in the movie and his mom is obviously working to support the family. It is unclear if he left or died. The novelization adds a bit of dialogue when Alex shows Grig the photo, making it clear Alex's father died not too long ago. Maggie appears to have nobody but Granny, with no mention of her dad or her mom. "Me, die? And miss all the excitement? Oh, no. I was merely dormant while my body repaired itself." Ditto Aliens: Although the member species of the Star League are visually diverse, members within most species are distinguishable only by their clothing. Played for laughs when Grig rapidly flashes through photos of his 600-member family; the images are a blur of various Lizard Folk of different height and dress, all sharing the same face. Do Not Adjust Your Set: Xur's introduction at the Starfighter base, when he takes over all their communications. The '80s: Primarily the video gaming culture that had spawned that decade. Eureka Moment: Alex realizes that hide and seek can be used to bypass the armada to get to the communication turret. Everybody's Dead, Dave: Alex returns to the Starfighter base to find it in ruins, with the majority of the personnel dead and all but one of the Gunstars destroyed. Evil Is Hammy: Xur, oh so very much. It's amazing the hull of his command ship was able to withstand his vast scenery chewing. Evil Laugh: Xur at the end of his speech to the Starfighter base personnel. He also does it in the faces of the Ko-Dan commanders and the First Officer is all for throwing him out the airlock right there and then. Evil Wears Black: Xur wears a black outfit. Face Death with Dignity / "Facing the Bullets" One-Liner: By one of the villains. Ko-Dan Officer: We're locked into the moon's gravitational pull! What do we do? Commander Kril: (monocle/visor snaps into place) We die. Face Palm: A rather unusual one by Beta when he sees a Zando-Zan landing on Earth, since his head is on the desk. It's sort of a third-person face palm. The Faceless: Beta before shaking hands with Alex. This apparently is some sort of DNA extraction / analyzer, as Beta is growing a new face - Alex's - that night. Family-Unfriendly Death: The spy is executed by Xur by having his skull then brain melted. And no, there's no Gory Discretion Shot. Even the DVD Commentary acknowledges how extreme it is compared to the rest of the film. It's even worse in the novel: the spy has a helmet placed over his head, then the helmet shrinks around the poor guy's head, crushing his skull, slowly. At the end, all that's left of the spy's head is a pointed nub of neck bone. Centauri: Alex! Alex! You're walking away from history! History! Did Chris Columbus say he wanted to stay home? Nooooo. What if the Wright Brothers thought that only birds should fly? And did Galoka think that the Ulus were too ugly to save? Fanfare: The theme is one, which adds even more trumpets at the end. Fatal Family Photo: Inverted. One might expect Grig showing Alex the photos of his family to lead to this, but instead it helps Alex realize what he's fighting for.... and how to fight for it. The Federation: The Star League. Fictional Video Game/Licensed Game: Atari Inc. was originally slated to develop arcade and home video games based on the movie (the game(s) were even mention in the closing credits). They were cancelled for various reasons, including the sale/division of Atari Inc. into Atari Games and Atari Corp. The home computer game was eventually released (with minor changes) as Star Raiders II. Fighter-Launching Sequence: Played for Laughs, as the ship takes off when Alex is basically told that he has to take on the Kodan Armada all by himself, and he's likely cussing up a storm under his helmet. Final Speech: Centauri's big death scene. Or so we think. The Game Come to Life: Or the game was based on an already real situation. Girls Have Cooties: Louis doesn't actually believe this (having his stash of Playboys and all), but when he sees Alex and Maggie being romantic, he rolls his eyes and mutters, "Diarrhea!" in disgust. Glowing Eyes: Centauri, when not wearing his human prosthetic mask. Good Colors, Evil Colors: Rylos and the Ko-Dan sets were set up this way, as told in the DVD Commentary. Greater-Scope Villain: The Ko-Dan Emperor is never seen or heard in the film, only being mentioned a couple of times by other characters. However, he's the one providing the armada Xur uses to breach the Frontier and attack Rylos (and presumably the one who gives Kril permission to get rid of Xur once his usefulness in getting past the Frontier was over). The Greys: What Centauri looks like without his human mask. Guy in Back: Inverted and Deconstructed. The hero is a gunner, not a pilot, which would traditionally be the rear position. However, the Gunstars are so sophisticated that the rear position is for navigation rather than piloting; the ship pretty much flies itself. note May count as Truth in Television. This mimics the setup of the real world AH-64 Apache helicopter gunship, which also set the gunner in the front for maximum field of view in combat. Hand Wave: "Oh, I won't bore you with the details." Complete with a literal hand wave. Centauri sacrifices himself to save Alex from an assassin. He gets better. Beta prevents a Zando-Zan spy reporting that Alex is still at large by ramming the spy's ship with a truck, causing an explosion that takes out the spy, the ship, and himself. Hoist by His Own Petard: If Xur hadn't sent assassins to kill Alex, he might never have returned to Rylos. Also ordering an invasion insured the fleet rushed ahead, making Alex's sneak attack even easier. Hologram Projection Imperfection: While Xur's Huge Holographic Head is appearing in the Starfighter base, it flickers and distorts. I Choose to Stay: After saving the galaxy, Alex and Maggie leave Earth to seek their future in the stars. Grig: You will stay, won't you, Alex? Centauri: Of course he'll stay. I Have No Son! : Xur's father disowns him for his monstrous crimes. I Know Mortal Kombat: The movie is an explicit justification of this trope; the video game is designed to be a training and recruitment tool. I Like Those Odds: One Gunstar against the entire Ko-Dan armada. Grig likes the idea, but subverts the trope in that he thinks it'll be a Bolivian Army Ending. Insignificant Little Blue Planet: Earth isn't advanced enough to even know about the Star League, much less participate. Centauri retorts that it's irrelevant. Centauri: Earth's in danger too, isn't it? I Wish It Were Real: Except that when it does turn out to be real, all Alex wants is to go home again. Jerk with a Heart of Gold: While Centauri seems like Snake Oil Salesman, he means it when he says he always had the best intentions for Alex. He's also correct in pointing out that while Earth isn't advanced enough to be introduced to the Star League, they're still in danger and deserve the right to help defend themselves. Karma Houdini: At the end of the movie, Xur flies off in an escape pod and is never seen again (though it was done as a Sequel Hook). Keystone Army: The Ko-Dan mothership coordinates all of its fighter craft via a single communication turret. This allows them to act with unparalleled efficiency and coordination, but if taken out, reduces them to near helplessness. Kill and Replace: Zando-Zan assassins do this to a local cop and a hitchhiker. Large Ham: Xur, to the point that even his Ko-Dan allies find him annoying. "How long must we endure this fool?" Centauri has his share of moments (Robert Preston seems to be having a grand ol' time) and Grig has one or two as well. The Last Title: The title. Alex manages to be an exceptional Starfighter, despite having grown up in a trailer park on Earth. This is justified as Alex has been playing the game at-home repeatedly (to the point of making the high score), and since the gunner controls are actually near-identical to the game's, so long as Alex is good at one, he'll theoretically be good at the other too. The game was also used to recruit on Earth for this exact purpose. While the skill and reflexes needed are just as rare on Earth as everywhere else, more advanced worlds have very few people with the stomach for even simulated fighting. Lizard Folk: Grig is a heroic example. Losing Your Head: The Beta unit can remove (and replace) its head, which can still remotely control the body. Macross Missile Massacre: Coupled with Beam Spam, Death Blossom is a Desperation Attack that fires all of the Gunstar's weaponry at once. Meaningful Echo: When Alex repeats the attraction line from the video game, just before readying to attack the actual armada. The Mole: The Rylan recruitment officer who argues with Centauri after Alex is brought in later sabotages the base's defenses during Xur's attack. The Mothership: The Ko-Dan mothership is the home of their fleet and also serves the role of The Battlestar. Mouth Stitched Shut: True for Ko-Dan mooks, who speak with a synthesized voice. Formerly true for high-ranking Ko-Dan officers, where it's readily apparent where the stitches used to be. Multi-Directional Barrage: What makes the "Death Blossom" attack so effective is that the ships rotates like crazy on all three axis, making sure no direction is safe when in range. Mundane Made Awesome: Granted, beating a difficult video game is worthy of a high five or two, but when Alex goes for, and beats the Starfighter record, the trailer park acts as if The Beatles just came to town (though it is probably the most exciting thing that's happened there lately). Nice Guy: Alex, who's sick of being selfless. He's constantly helping the hapless trailer park residents with their problems, but never has any sort of time for himself. When he gets turned down for financial aid at a university he was interested in (possibly forcing him to go to the local city college), he suffers a Heroic BSoD. Nintendo Hard: Starfighter. Despite being a Rail Shooter, the second Alex lets Louis take over, he's immediately killed. Apparently, no one has ever defeated the Command Ship before, which attracts Centauri's attention. Grig mentioning Centauri's "old Excalibur (Test) tricks" when he finds out how Alex was recruited. Centauri's Famous, Famous, Fictional mention of Galoka and the Ulus. Novelization: Written by Alan Dean Foster. Most noted for a vastly expanded showdown against the Ko-Dan, including "refueling" the Gunstar by flying it near the surface of a star. Oh My Gods! : Centauri tells Alex Rogan, "May the luck of the Seven Pillars of Gulu be with you at all times. "note "Oh, these cheapskates are going to thank Centauri, trust me. Bula!" Only Mostly Dead: Centauri was just going into a deep sleep while his Healing Factor kicked in. Alex Rogan escaped the Ko-Dan Armada's destruction of Starfighter Command by Colony Drop because he was off-planet at the time, having refused to become a Starfighter in the first place. Organ Autonomy: Demonstrated by the first Zando-Zan after its arm was shot off by Centauri. The Gunstar he ends up piloting was in a separate hangar because it was an advanced prototype. Pardon My Klingon: The audience does get to hear some Rylan putdowns before the Translator Microbes are activated. Rylan Bursar: (on seeing Alex) ... eh sanchay..! Parental Obliviousness: There is no sign that Alex's mother notices anything wrong with Beta, who's pretending to be him. Justified in that she's almost always at work, and Alex seems to be just a moody teen who just learned he was turned down for a college loan when she is home. Passing the Torch: As Alex and Maggie head into space, his younger brother, Louis steps up to the Starfighter video game, and watches as the Gunstar flies into the stars. It's implied that Louis might join his brother among the stars. Perfect Pacifist People: The Star League, who had to recruit from hundreds of member planets to find a roomful of warriors who "possess[ed] the...gift". The novelization even describes the League President as turning queasy at hearing their Battlecry. Photoprotoneutron Torpedo: The checklist that Alex runs down with Grig while they ready their Gunstar for battle includes "particle beams" and something called "proton poles". In the novelization, Grig says that the real names involve science too advanced to translate, so he uses the game terms for the sake of convenience. Poor Communication Kills: A key difference between Xur and the Ko-Dan is their reaction to a partial transmission. Beta: I said back to sleep, Louis, or I'm telling Mom about your Playboys! Present Peeking: Referenced by Centauri. Centauri: (to Alex) Hey, are you kind of kid who reads the last page of a mystery first? Who pesters the magician to tell you his tricks? Who sneaks downstairs to peek at his Christmas presents? Noooo, of course you're not.note "That's why I'm not-gonna-tell-you!" Proud Warrior Race Guy: Most of the Starfighters are from a race of Cthulhumanoids that are noted for their love of fighting. Given their still tiny number, this is only relative to the rest of the pacifist Star League. Rail Shooter: How the Gunner deals with enemies, which makes the arcade game "simulator" a Justified Genre. Ramming Always Works: Combined with Taking You with Me in both cases. Beta crashes his borrowed truck into the assassin's spaceship. Commander Kril gives the obligatory order in an attempt to ram Alex's stationary Gunstar. Kril: FORGET THE GUNS! RAMMING SPEED! Red Eyes, Take Warning: Averted with Centauri's true form, which has red eyes but is not evil. Still striking enough to cause a minor Jump Scare the first time we see it. Red Pill, Blue Pill: Subverted at first; Centauri does a very hard sell to pressure Alex into becoming a Starfighter, up to "kidnapping" him (but not really), and taking him to the Star League and having him sit in a mission briefing, but Alex still turns down the offer. Refusal of the Call: Alex wants to get out of his small town, but isn't sure he wants to get involved in an interstellar war. Yet this refusal is followed by Xur And The Ko-Dan Armada Know Where You Live. Ridiculously Human Robot: Beta absorbs Alex's DNA and thereby copies him with near perfection, but has a hard time learning all of the humans' customs. Like the tongue in the ear thing. Robotic Reveal: Beta is shot by the assassin, revealing his robotic insides to both his attacker and Maggie. Robot Me: Beta is a duplicate of Alex intended to cover up his absence from Earth. Robot Names: "Beta" is not a name, but a designation for a type of robot. Alex: (depressed) Otis, I just never have a chance to do anything around here. Otis: Things change. Always do. You'll get your chance! Important thing is, when it comes, you've got to grab it with both hands, and hold on tight! Rule #1: "Always trust Centauri! "note According to Centauri. Though, technically, this piece of advice is actually #3. The first was "You're on Rylos, my boy. Stop thinking Human." Followed by "You've got a good thing going here. Keep smiling. Don't blow it." Rule of Symbolism: Why is the official starfighter test called the "Excalibur test"? It's because the idea for this movie came from one of the filmmakers watching kids play arcade games, while he read The Once and Future King, and thought of a video game being a sword in the stone. So the term is an in-joke. The Frontier is an energy field that encapsulates (or at least cordons off) an entire section of the known galaxy. The energy field is projected by field generators that are placed, at best, ten kilometers apart. That would be a septillion (10 to the power of 24) generators per square light year of barrier, with a few billion of those for one third of the galaxy. The novelization changes this to state that the Frontier is a political designation and that, rather than knowing how to defeat it, Xur instead knows the location of the Starfighter base. Also, it changes the destruction of a force field to the traitor giving the enemy the codes for the League No Warping Zone generators. The Ko-Dan command ship's Colony Drop against the Star League base. Leaving aside the pinpoint accuracy required to hit a particular planetary target from space distances, the Frontier is apparently well within Rylos' star system because otherwise it would've taken tens of thousands of years for the meteorites to hit at sublight velocities. The running gunfight at the end concludes a few minutes after it started just inside the Frontier with the out-of-control Ko-Dan flagship colliding with Rylos' moon. Either both sides continued to travel at superluminal speeds throughout (which seems unlikely given how long it took the Mothership to close on the stationary Gunstar) or the Frontier really is inside the Rylos system. note Logically, as the (only?) military base and primary launch/training platform of the Starfighters, Rylos would be close to the border of an obviously hostile star nation. Screw This, I'm Out of Here! : Alex's reaction to being unknowingly "recruited" into an alien war is about what you'd expect. Seize Him: Commander Kril gives this order to the Ko-Dan soldiers after Emperor Xur screws up. Sentry Gun: An array of automatic defensive turrets protects the Star League's base, and do quite well at it until they are sabotaged. Serious Business: Getting a high score in a video game is so important that it gets the entire trailer park's attention. Given Alex' complaints about how boring his hometown is, it may well be the most exciting thing around. Also, Alex seems to be well-known and well-liked (at least among the older residents), so it may have been less about breaking the record, and more about Alex breaking the record. Simulation Game: The Starfighter game is a simulation of the real thing. Small Town Boredom: Alex lives in a trailer park with so little to do that a video game is considered the pinnacle of excitement. Snake Oil Salesman: Centauri is a space version, peddling video games around the galaxy but conveniently failing to mention that they are a recruitment tool. Sound-Effect Bleep: What is surely a truly spectacular string of profanity from Alex is conveniently drowned out by the noise from his and Grig's Gunstar taking off. Space Fighter: The Gunstars and Ko-Dan fighters. The Gunstars apparently operate without the support of a battlestar-equivalent. Stay with the Aliens: Alex remains with the Star League to help them rebuild and to train their next generation of Starfighters. Super Prototype: The Gunstar that Alex and Grig use is stated to be an "advanced prototype" featuring numerous improvements over the current line of Gunstars, such as better armor, better weapons, and experimental systems such as Death Blossom. Since it was a work-in-progress kept in a separate part of the base from the main hangar, it's also the only Gunstar to survive Xur's sneak attack. It also breaks down after annihilating the armada due to the prototype superweapon draining all power, and Grig has to hot-wire the life support systems to jumpstart the reactor in order to get them out of the way of the charging command ship. Synthetic Voice Actor: Most of the aliens that are not largely human in appearance have heavily filtered voices, with the notable exception of Grig. Taking the Bullet: Centauri does it to save Alex from a Zando-Zan energy bolt. Tech Marches On: Grig's amazing photo album - thousands of pictures stored in a device you can hold in your hand/tentacle/pseudopod! It seemed fantastic, back in the The '80s. Now, of course, it doesn't do enough compared to what's available only 30 years later, though it might have other capabilities that weren't shown. Traitor Shot: One of the Rylans is secretly a Xur follower. The camera holds on his face just before he plants an explosive device. Rylan Officer: No, you hear English thanks to the translator device. Viewers with good ears can tell when the device becomes active, because the background chatter switches instantly from Rylan to English. Translation Convention takes effect after Alex is given the translation device, as conversations among aliens from then on are heard in English even when Alex isn't around. Unfinished, Untested, Used Anyway: The Death Blossom device in Alex's Gunstar has never been tested. Grig tells Alex that using it might overload the systems and blow up the ship. Alex convinces him to use it anyway, and it destroys all of the Ko-Dan fighters. Vertical Kidnapping: Attempted when an alien assassin is sent to kill Alex. A Villain Named "Z__rg": Xur fits, pronunciation-wise. Villainous Breakdown: Xur, once his allies have had enough of his bizarre personality. Xur: How dare you! I am the Emperor of Rylos! I and I alone command this entire arm— (guards begin to drag him away) Release me! I command you! YOU WILL PAY FOR THIS WITH YOUR LIVES! Villain: Exit, Stage Left: Xur, during the impact strikes of the Gunstar. Saved for the Sequel that never happened. Voluntary Shapeshifting: The Zando-Zan assassins are shapeshifters. Also Centauri, to some extent. Warrior Heaven: Grig prefers to think his fallen comrades are "battling evil in another dimension". Wave Motion Gun: Inverted, rather than using all available energy to fire one huge shot, the Death Blossom uses all available energy to fire a storm of little ones. And spin like a top. You Owe Me: Beta, almost word for word, to an absent Alex during his Heroic Sacrifice. "You owe me one, Alex." You're Not My Father: Inverted. Xur mocks his familial relationship to his father, who in turn disowns him. You Have Outlived Your Usefulness: While Xur believes himself the leader of the Ko-Dan armada, he is in fact useful to them in exactly one way: by having the codes to the Frontier. Once he's served that purpose, he is rapidly shunted aside. Earlier, the Ko-Dan second-in-command whispers to Kril, "How long must we endure this fool?" Kril motions for him to shut up, since Xur is still in the room.